Bentonite clay has great healing properties and is natural, safe, cheap and simple to use at home. In fact, many clay users claim its benefits exceed most dietary supplements. 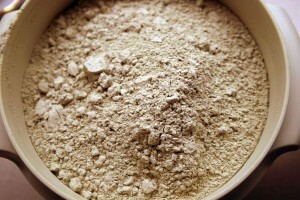 Bentonite clay benefits includes supple, soft skin, healthy hair and healing detox baths. 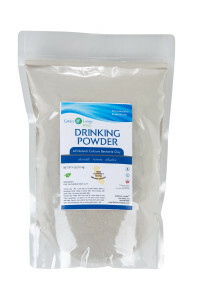 Many drink bentonite clay to detox the digestive tract, the liver and the entire body. My wife and I have tried a few different clays and are aware of the many benefits. If you decide to try healing clays, then follow the guidelines below to safely enjoy bentonite clay benefits. Bentonite clay belongs to a group of volcanic minerals with a negative electromagnetic charge. It looks like a fine grey or green powder. When combined with water, bentonite clay acquire some amazing healing properties. Hydrating (adding water) to bentonite powder changes the properties of the clay. Hydrated clay gains the ability to absorb and adsorb large amounts of harmful substances. When hydrated, bentonite clay carries a negative electrical charge. On the other hand, toxins, bacteria, virus and other harmful substances mostly carry a positive charge. Therefore, hydrated bentonite clay works almost like a magnet, pulling and bonding with positively charged metals, toxins and unwanted microorganisms in the body. Harmful substances are absorbed by the clay and can be are safely removed from the body. This is the reason why bentonite clay is so very versatile, it can solve different issues in the digestive tract and the whole body. Bentonite clay detox: There are several ways to do a thorough detox. However, if you follow the simple procedures below, you will gradually cleanse you body from metals, toxins and other waste products. Harmful substances inter the body through the use of commercial skin care products, cosmetics, processed food, soda and dental mercury (silver) fillings. Many experts favor the fine calcium bentonite clay from the California Mojave desert. And after trying it for a while, I must agree. It has excellent healing properties, is easy to mix with water and can do wonders for your skin and health. This is also the best one to use internally. It is tested antimicrobial in the Arizona State University Study. Earth’s Living Clay have a very nice selection of high quality green calcium bentonite clays. These clays are of the highest quality. Sodium bentonite clay: This clay from Wyoming is an amazing absorbent. When mixed with water it swells many times it own weight. This clay works very well in clay baths and on the skin and also to drink. It makes you skin really smooth and supple. We found bentonite clay powder from a company using it in the building industry. A 50 pound bag was $25, which was way cheaper that elsewhere. However, make sure it’s pure bentonite without additives. This kind of sodium bentonite is not for internally use but perfect in clay baths and in clay face masks. To use it internally, you should buy a food grade clay. French Green clay: Closely related to bentonite. Also a very effective mineral clay. Great in face masks and baths. Can be consumed, but only in very small quantities. Redmond Clay: A great sodium bentonite clay, richer that the one from Wyoming. Can be used both internally and externally. 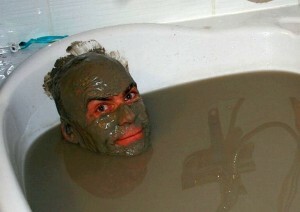 The author taking a 45 minute soak in bentonite clay. A great way to relax, get soft, supple skin and to do a thorough cleanse. Used externally you will find that any pure bentonite or other healing clay will make your skin soft and supple. We discovered that a wonderful way of using healing clays is to take a muddy bath. Healing clay baths utilize the clay’s strong drawing powers to help pull toxic debris out through the pores of the skin. This has been confirmed in studies. Through a pulsing action, bentonite clay will pull out infectious organisms, heavy metals and other major toxins through the skin. Clay baths are very beneficial for dry, flaky skin, eczema, psoriasis or some other inflammatory condition. My wife has normal skin and I have very dry skin. Interestingly that we both thought the clay bath made our skin much more supple, soft and clean. Some start with 1-5 cups of clay powder mixed with hot water in the tub. (I’ve tried using up to 10 punds (5 kg) of clay in one bath.) It’s easier to mix the clay if you do it in just a little hot water. Some use a mixer or blender to mix water and clay powder and then pour this mix into the bathtub water. Others mix the clay powder with hot water in the tub using a whisk; dissolve all the clay lumps. Do not add any oils as they might decrease the effect of the clay. Earths Living bentonite clay is very easy to mix in water. However, you can add 1-5 cups of sea salt. The water should be in a comfortable temperature. Stay in the bath for 20-40 minutes. When the clay extracts toxins, some people might feel a little nauseous or fatigued. However, after a few baths most feel relaxed or even energized. Clay baths are excellent once or twice a week. Don’t’ worry too much about precise amounts in these simple recipes. The hydrated bentonite clay should be like a gel, without clumps and holding together. It should not be running. 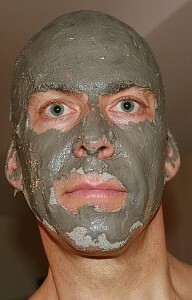 Clay masks are great for acne, dry skin, shrinking pores and even for wrinkles. This is also on of the best exfoliating masks we have tried and leaves you skin really soft and clean. And after a few days using clay masks the skin turns almost radiant. Love this stuff! Try a mask once or twice and see how your skin responds. Some have had great success with acne. They use clay masks daily for two weeks. After that twice weekly. However, since acne is often an indication of unbalances inside the body, face masks might not be enough to remove all acne. Consuming bentonite clay daily for two weeks has helped other resolve this issue completely. Calcium bentonite: Mix 1 part clay powder with two parts water. Wait some minutes until the powder have absorbed the water. Sodium bentonite: Mix 1 part clay powder with 3 or 4 parts water. Sodium bentonite swells much more than calcium bentonite. This was another nice treat! Though you may look a bit freaky with all that mud in your hair, my hair and scalp felt great after rinsing the mud out. I have very dry skin but it stays smooth with one or two treatments a week. And the clay is very simple to apply. Drinking bentonite clay will take your mud experience a bit further. Too far? Not really. Lots of people do it. Used internally bentonite clay is able to draw out heavy metals, harmful microorganisms and other impurities from the digestive tract. Your body uses the gut as a main exit for many waste products. Drinking clay water effectively cleanses the colon by pulling out plaque and other substances that can prevent absorption of vitamins, minerals, and other nutrients. Many experienced clay users agree that the best bentonite for internal use is the green desert calcium bentonite found in the California Mojave desert in the Death Valley area. But others say the gray/green sodium bentonite from Wyoming is also fine. Redmond clay is another good sodium bentonite. Use the 1:8 ratio. 1 part clay powder and 8 parts filtered water or spring water. The taste? Well, don’t compare it with your favourite drink. But drinking clay is actually not too bad. The calcium bentonite we tried has an oily, almost creamy texture. We just gulp it down. Once in your stomach, the clay will not absorb nutrients, vitamins or minerals from foods you eat. And the clay will not absorb the beneficial bacteria in the gut. In fact, bentonite clay promotes the growth of good gut bacteria.